For almost 15 years there was only one question that was ever asked on this unusual quiz show: "Can you top this?" In fact, the people who answered the question were not the people who received the prize money! 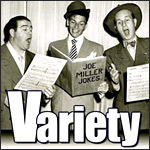 Here’s how it worked: Listeners from all over the country would send jokes in to the show and a panel of three former vaudeville performers would be asked to "top" them with something funnier. If a listener’s joke was used on the show, they would receive a prize of $5. Then, if resident funnymen "Senator" Ed Ford, Harry Hershfield and Joe Laurie, Jr. couldn’t "top" the joke by making the in-studio "laugh meter" register a higher decibel level, then an additional $2 would be given to the listener. However, with such a talented panel of comedians, that extra $2 was pretty hard to come by! (1/11/1947) CAN YOU TOP THIS? (1/18/1947) CAN YOU TOP THIS? (1/25/1947) CAN YOU TOP THIS? (2/1/1947) CAN YOU TOP THIS? (2/8/1947) CAN YOU TOP THIS? (4/23/1948) CAN YOU TOP THIS? (4/30/1948) CAN YOU TOP THIS?